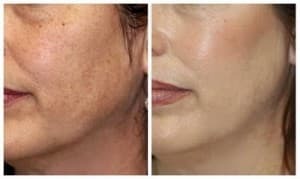 Medical grade microdermabrasion is a technologically advanced technique which resurfaces, cleans and smoothes the skin using microcrystals and a controlled vacuum to remove dry, dead skin cells in order to reveal the fresh, younger skin below. Microdermabrasion cleans the skin thanks to a vacuuming action which clears out the blocked pores. The second phase sprays a fine jet of inert crystals onto the skin surface, which gently smoothes the skin and removes the outer layer of dead cells through abrasion. The procedure is quick, easy, pain-free, and produces reliable results. *Please note that individual results will vary and may not exactly match Before and Afters. Most treatments will involve a maximum of four (4) microdermabrasion procedures. Treatments are provided in a series of sessions, usually at one- to two-week intervals, and involve no patient downtime. Follow-up care may include monthly maintenance sessions. Our skin experts can also recommend and include from among our products topical creams and oils for you to apply at home and that meet your specific dermal needs. Interested in microdermabrasion? Contact us today! © 2019 New Radiance Cosmetic Center of St. Lucie. Enter your name, email and phone below for 25% Off SculpSure and $1500* in Free Treatments which increase fat loss by up to 60%! Enter your name, email and phone below for 20% Off Coolsculpting and $750* in Free Treatments.